A D.C. councilmember said the city would be willing double its yearly funding of Metro if Maryland and Virginia agree to do the same. 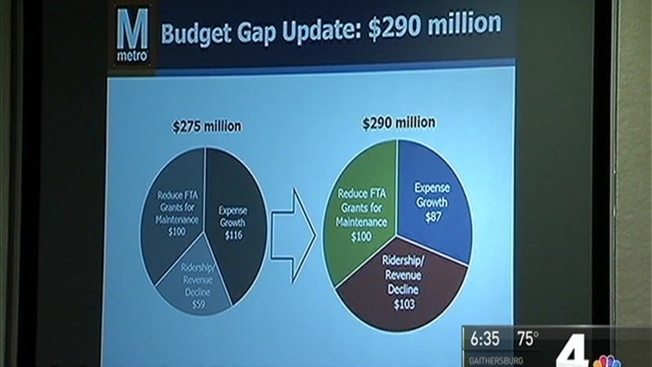 Metro General Manager Paul Wiedefeld laid out his budget proposal Thursday calling for a possible fare increase, cuts in service and layoffs. The transit agency’s largest union blasted the plan. Metro is facing a budget gap of almost $300 million and the main reason is lost revenue because riders are staying away due to poor service and painful maintenance. "The approach that I'm proposing is what I’m calling a shared sacrifice to get us to a balanced budget," Wiedefeld said. Representatives from Metro's largest union are angry at the thought of cutting front line Metro employees. "I feel like we are being scapegoated for their lack of management,” ATU Local 689 President Jackie Jeter said. “They have failed to manage the system the way it is supposed to be and now they are saying the problem is labor costs." The union also is being asked to scale back on benefits. "I feel like we are being scapegoated for their lack of management," Jeter said. The union said it will protect itself from the transit agency's demands. "As a union, we are looking at those things, and I can tell you we will do whatever is necessary," Jeter said. The union stopped short of threatening a strike. D.C. Councilmember and Metro Board Chairman Jack Evans said the burden of closing the gap shouldn’t fall to riders. "Most of us don't ride public transportation, but we pay for it because it is a critical element in our region,” he said. “That's why the region should pay for this, not the riders." Evans said he hasn’t asked Mayor Muriel Bowser about doubling funding for Metro but assured that she is on board. There’s no word from Maryland or Virginia if they'd be willing to pay more to close the budget gap.